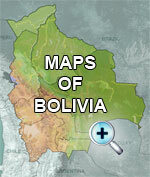 Time in Bolivia is UTC/GMC - 4 hours. Time in Bolivia is - 4 hours (in winter) to - 5 hours (in summer) different from England and from + 4 to + 1 hours From the the states. Bolivia does not use daylight saving time. Bolivians usually arrive about a half hour late for appointments when meeting friends in a coffee shop or restaurant. They will arrive on average about an hour late for invitations to someone's home. Don't forget to confirm a day in advance and reconfirm a half hour in advance. You should arrive promptly at the airport, bus station, public offices and the movies.